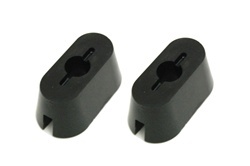 Torque Solution polyurethane engine mount inserts that replace the soft inner rubber material of the OEM Lower Engine Mount. Includes 2pc for each application. These give you improved traction and reduced wheel hop without too much vibration. Also stops the pitching of the engine under hard acceleration and on/off throttle situations which in return allows you to put the power to the ground!!! !